ABA-X1 is a program that calculates mathematical expressions. 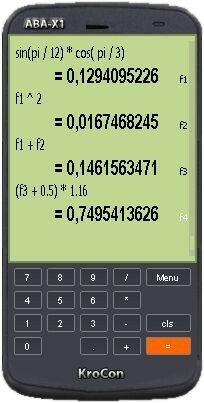 ABA-X1 is an application that calculates mathematical expressions. It has a large number of built-in operators and functions. abs, acos, asin, atan, cbrt, ceil, cos, cosh, degrees exp, expm1, floor, log, log10, log1p, rad, radians, rint, round, signum, sin,sinh, sqrt, tan, tanh, ulp. Look at java.lang.Math for a detailled description of these functions. A function can be typed in with code completion: click with the mouse on the green display and type with the keyboard. Type 's' and press Ctrl+Space and see what happens. This behaviour is called code completion. Code compeletion also works for built-in (predefined) constants. Type 'm' and press Ctrl+Space to get a list of atomic weights (remember m like masses). A atomic weight constant begins with a 'm' and ends with it's element symbol. Sample: mCa for Calcium, mS for Sulfur. Type mC and press Strg+Space and see the list of all elements which starts with an C.
Physical constants are also predefined. The prefix is p. Press p and Strg+Space to see the list. All constants and function can be selected (and inserted) via the menu. Click on the 'menu' button to open the main menu. You will see the sub menus 'Functions', 'Vars' and 'Constants'. A function, variable or constant will be inserted at the current place (cell) by selecting the menu item. Click on the '=' button or (while editing with keyboard) press Strg-Enter to stopp editing and recalculate all expressions.